The venue is the Allegheny Theatre in Philadelphia, PA. 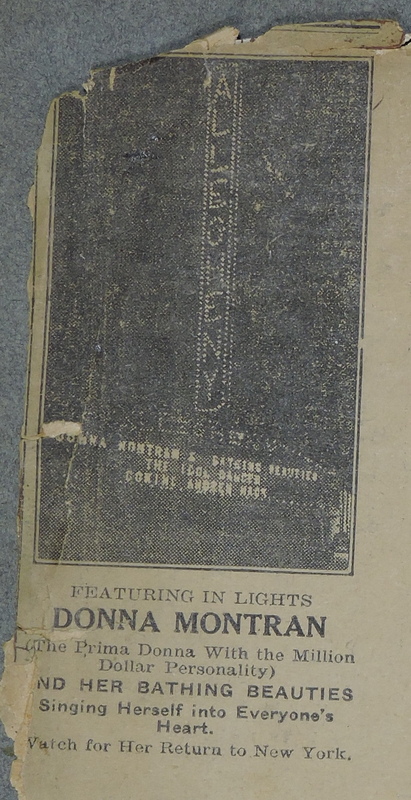 Program – Allegheny Theatre – September 27, 1920. Of particular interest is a program of the show the week of September 27th, 1920. For the Allegheny Theatre. It shows us that the Allegheny claimed to be “The largest Vaudeville Theatre in the World.” It also provided a list of the acts. A musical overture started the show followed by a “review of current events.” I’m sure that was really important as in 1920 America so many people didn’t read and write. Current Events was followed by four different Vaudeville acts before the main live act. Tom Rooney presents “The California Bathing Girls and Donna Montran in ‘A Beach Promenade’ in 6 gasps and 3 shocks. Conceived and staged under the personal direction of Earl Lindsay.” The show was followed by “The Idle Dancer”[sic] directed by D. W. Griffith. It was a 1 hour, 44-minute silent film “The Idol Dancer.” Following the film was an “Exit March” performed by the orchestra. A musical overture started the show followed by a “review of current events.” I’m sure that was really important as in 1920 America so many people didn’t read and write, so learning the Current Events of the Day was a great feature. The live show was followed by “The Idle Dancer”[sic] directed by D. W. Griffith. It was a 1 hour, 44-minute silent film “The Idol Dancer.” Following the film was an “Exit March” performed by the orchestra. An advertising clipping relating to Donna’s Allegheny Theatre appearance. 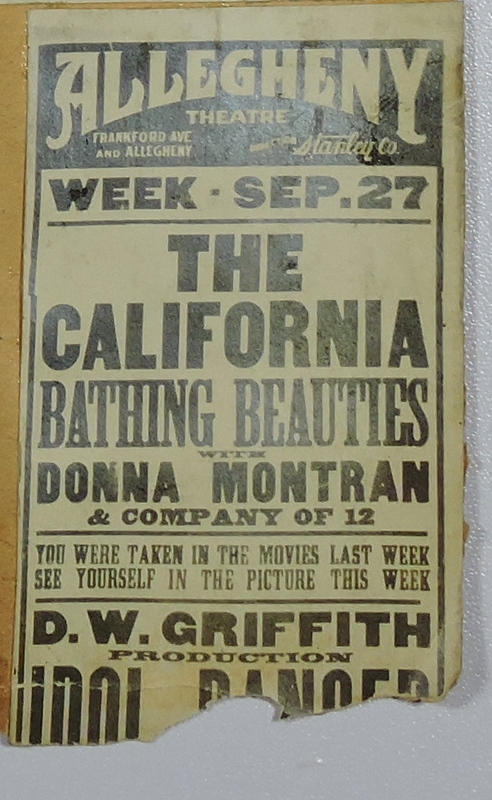 It let us know that her California Bathing Beauties show included a cast of 12. The ad also mentioned that “You were taken in the movies last week, see yourself in the picture this week.” According to an article in the “Philadelphia Inquirer” (Sep. 26, 1920) pictures taken at the theatre the previous week including many residents entire audience. Those photos were going to be shown on the screen this week. How fun. A great promotion for the theatre. Allegheny Theatre by Anthony F. Dumas, 1920. F. Keith’s Allegheny Theatre was designed by the firm of Magaziner & Potter; it opened in 1912. In 1926, it was remodeled by the firm of Hoffman-Henon Co.
By 1941, the theater became part of Warner Bros. Circuit Management Corp. In 1942, the theater underwent renovation by Golder Construction, Co. The theatre lasted until 1956 and has since been torn down. However, people on Cinema Treasures indicate the theater seated 2,858 in 1936. Likewise, Joel Frykholm, in his essay, “Framing the Feature Film,” found B. F. Keith’s Allegheny theater to seat 2,855 individuals in 1914. Sadly, the theatre is not listed in the Julius Cahn Theatrical Guide for 1913-1914, (the edition I have and use) as it must have been too new for inclusion. Also, the 1921 Guide doesn’t list the Allegheny Theatre either, but it does list the B. F. Keith Theatre which had a seating capacity of 2,300. How the theater could have gone from 2,855 in 1914 to 4,000 in 1920 and back to 2,858 in 1936 is beyond. I suspect the 4,000 number to be in error. Today the site is the location of “Friendly Plaza” the home of a Family Dollar Store and Friendly Wholesalers Inc. Furniture store. See Google Map. It is clear that B. F. Keith’s Allegheny Theatre was new in 1920, being about eight years old. It was also one of the largest theaters of its time. Donna played there for a week, but she and the California Bathing Beauties played several other Philadelphia theaters during the fall of 1920. I’ll write more about them later. It will take some additional research to determine the actual seating of B. F. Keith’s Allegheny Theatre in 1920 while Donna was there. ACTA UNIVERSITATIS STOCKHOLMIENSIS – Stockholm Cinema Studies 9 – “Framing the Feature Film: Multi-Reel Feature Film and American Film Culture in the 1910s” by Joel Frykholm citing: Advertisement for B. F. Keith’s Allegheny Theatre, Inquirer, March 1, 1914:17; and “Allegheny,” In Vaudeville’s Realm, Inquirer, March 1, 1914:16. http://manualzz.com/doc/17494960/stockholm-cinema-studies-9. Don Taylor: Donna Darling Digital Collection – Contact Author. Genealogy Bank – Philadelphia Inquirer (Philadelphia, PA) – September 26, 1920, (Volume 183, Issue 88) Section Feature, Page 1 – Changes in Vaudeville – Allegheny.